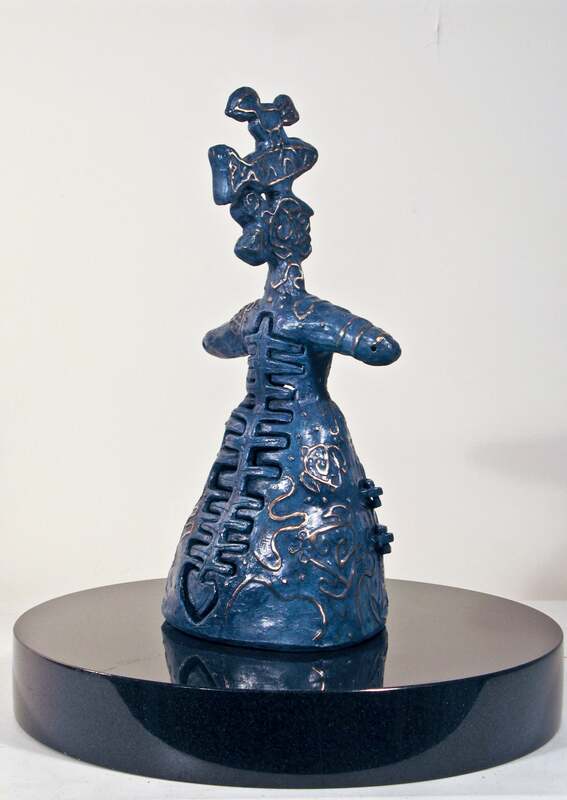 This Growing Stronger, bronze sculpture, woman with bird and fish heart and spine is no longer available. Growing Stronger, bronze sculpture, woman with bird and fish heart and spine The work is a self portrait of my state of mind when I am working on fixing things from inside myself. Thinking and praying a better life for those around me. In 1997 was hit head on by a drunk driver, it affected my back and my health beyond what I ever thought possible. The work I made in response reflects this time period in my life. The images inside the work are about balance and about making a stronger back for myself - in more ways than one! Melanie Yazzie As a printmaker, painter, and sculptor, my work draws upon my rich Diné (Navajo) heritage. The work I make attempts to follows the Diné (Navajo) dictum “walk in beauty” literally, creating beauty and harmony. As an artist, I work to serve as an agent of change by encouraging others to learn about social, cultural, and political phenomena shaping the contemporary lives of Native peoples in the United States and beyond. 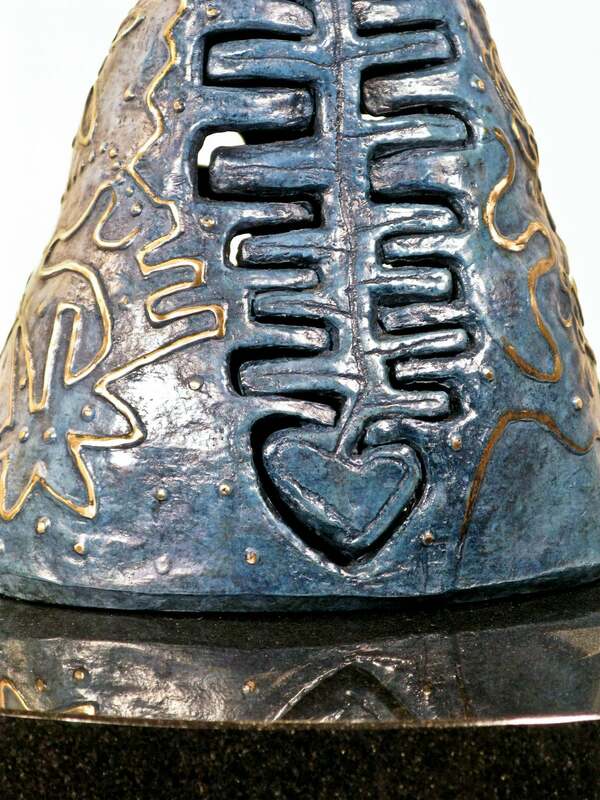 My work incorporates both personal experiences as well as the events and symbols from Diné culture. My early work focused on depictions of the harsh realities of Native peoples (i.e., racism, identity conflict, poverty, abuse, etc.) to bring to Native issues to the forefront, but more recently I have been making work with a positive twist. Due to personal health issues and trying to live a calmer life style, I have been focusing on quiet and balance. I believe my work is reflecting this shift. The work is also informed and shaped by personal experiences and tries to tell many stories about things both real and imagined. Melanie Yazzie exhibits internationally and is represented by Glenn Green Galleries exclusively since 1994. She is a Professor and Head of Printmaking in the Department of Art and Art History at University of Colorado, Boulder, Colorado. This bronze sculpture is in excellent condition. It has a hinged panel on the front of the skirt which opens. The signature of the artist and edition number is on the inside of the panel. Wearable art inspired by Melanie Yazzie's monotypes and paintings. Sterling Silver pendant/enhancer.